Butter doesn't really make everything better. Who wouldn't want to tuck into a big bowl of hot, salty, buttery popcorn? Apparently everyone ... besides Americans. In the U.S., butter is to popcorn as cream is to coffee. 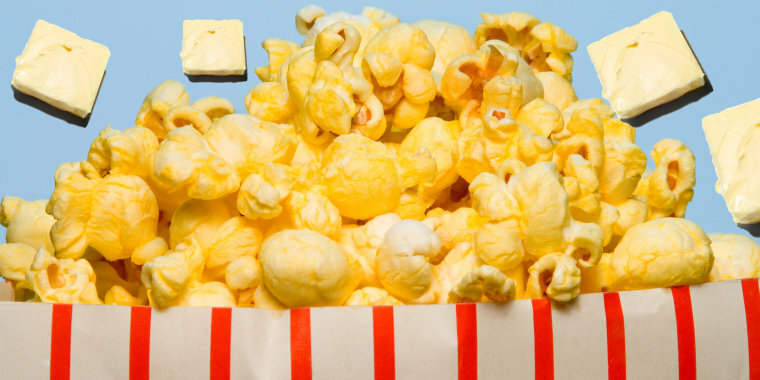 But to many around the globe, adding melted butter to popcorn is as unorthodox as someone eating mayonnaise straight from the jar — which is a pretty unanimous no-no. "I think it’s just one of those things that never caught on here," Laura Tunnicliff, who hails from the U.K., told TODAY Food. "You maybe see it in the supermarket if you go into the American section, like the microwave popcorn bags you get but you never really see it in cinemas or anywhere like that." We wonder what else is in the American section of a British grocery store? Perhaps endless stacks of Oreo's The Most Stuf cookies or Sour Patch Kids cereal? It appears that Tunnclif certainly isn't alone. Earlier this month, BuzzFeed posted an article titled "24 Foods The World Is Disgusted That Americans Actually Eat." Among pineapple-topped pizza (which has proven controversial even amongst Americans), ranch dressing and raw cookie dough, was buttered popcorn. Cue the collective internet freakout! Dozens of people weighed in, with many expressing disgust at the thought of buttered popcorn. Tunnicliff continued, "I just imagine it either makes the popcorn soggy, or it has that weird greasy taste that butter has. It’s a strange concept, I don’t really get why you’d do it to your popcorn, you’re just ruining it ... America can keep buttery popcorn." Alex Nimier, CEO of the Los Angeles-based Flight of Voices, was born in the U.K. but his parents are from Jordan and Australia. He, too, couldn't wrap his head around buttering up popcorn. "Putting butter on is indulgent for no reason," Nimier told TODAY. "It makes a popcorn swamp. We like the balance of sweet and salty in layers, so when you get bored of one, you discover the next layer and so on until the journey concludes." Throughout Europe, it appears that the anti-buttered popcorn sentiment is pretty strong, whether it came to using melted, traditional butter or movie-theater butter (which, of course, is butter-flavored oil). "As I’m Italian, I like to think that less is more — stick to the true flavor of the ingredients. I think we enjoy popcorn just with a bit of salt on it. Adding butter, surely makes popcorn more tasty, however, it is also something that we [Italians] would consider very 'American,'" Alessandro Stella, who was born in northern Italy, told TODAY Food. Since the BuzzFeed article was published, more and more people have weighed in on the butter debate. One tweeter, whose account says they're based Liverpool, England, thinks the habit of drizzling melted butter on popcorn kernels is "vile." Another person said that the habit is so bad Americans might as well cut their popcorn with a knife and fork. Let's leave pizza out of this for now and stick to one controversial food argument at a time.